Tonight we are going to switch gears and work on Art Explosion. An art student will be visiting our den tonight and teaching the boys about art, what it is like to go to school for art, and art careers. After that the boys will be making two self-portraits using two different techniques. Home Assignment: There are only a few more days remaining. 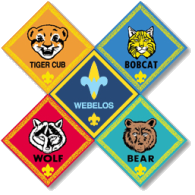 Please complete Webelos Badge Requirements by February 3rd so they can be presented at the Blue & Gold Banquet (Feb 23).